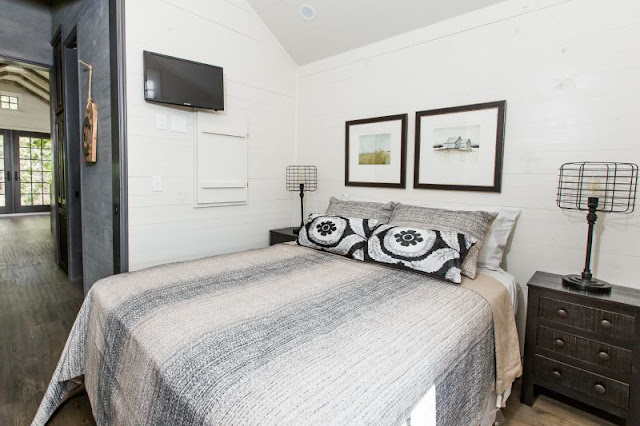 This week's featured small space is a 464 sq ft tiny house by Clayton Homes. 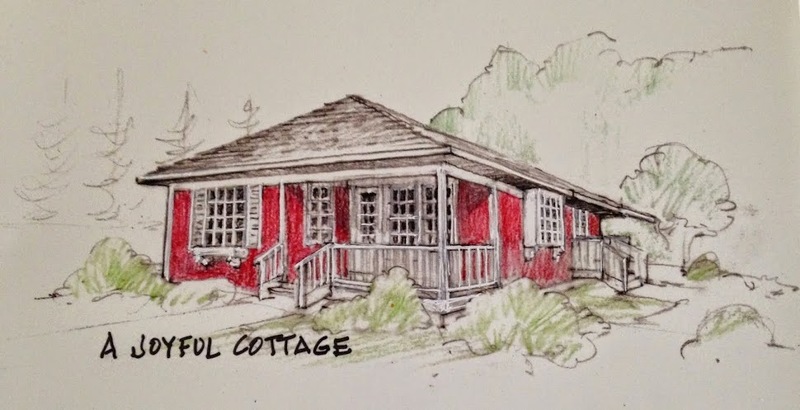 If you're a regular reader of A Joyful Cottage you know that my husband and I live in a 670 sq ft cottage we designed and had built just about three years ago. We considered several conceptual designs before moving forward with the one we finally built. The largest home we designed was about 1,200 sq ft, the smallest approximately 325 sq ft. We also considered a manufactured home, but scratched the idea when we couldn't find a home that met an important design criteria, namely it had to have character. 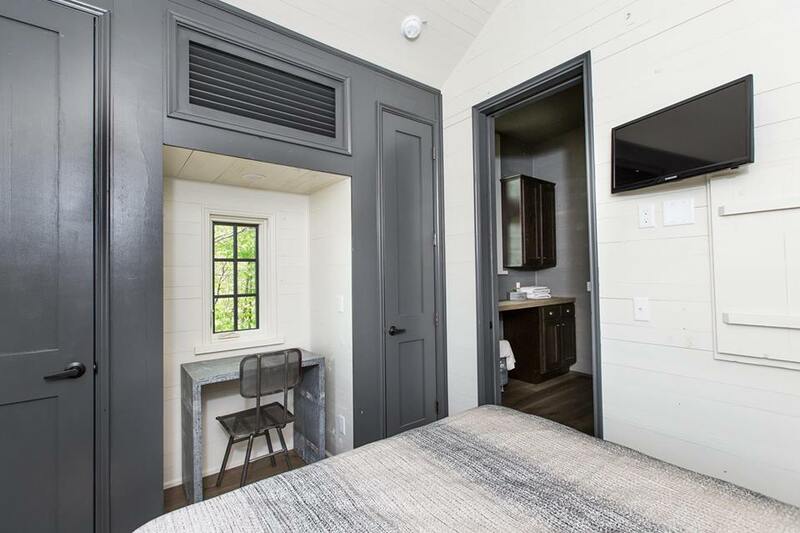 Things may have turned out differently had I first seen the home I'm featuring today: a tiny home designed by architect Jeffrey Dungan of Birmingham-based Jeffrey Dungan Architects as part of Clayton Designer Series tiny homes. The name "Low Country" comes from the southern region that inspired its design. 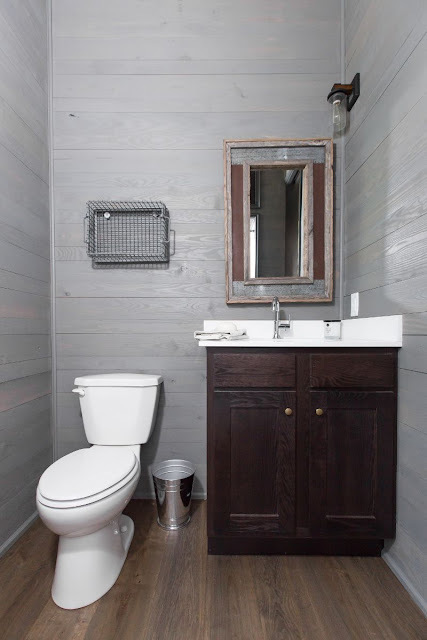 From the exterior's poplar bark siding with 1x4 vertical shiplap and cedar shake and metal roof, to the easy flow of the interior, this tiny home is big on character. Let's take a look inside. Double entry doors open wide to a living room with vaulted exposed beam ceiling, ship lap walls and an abundance of gorgeous windows. 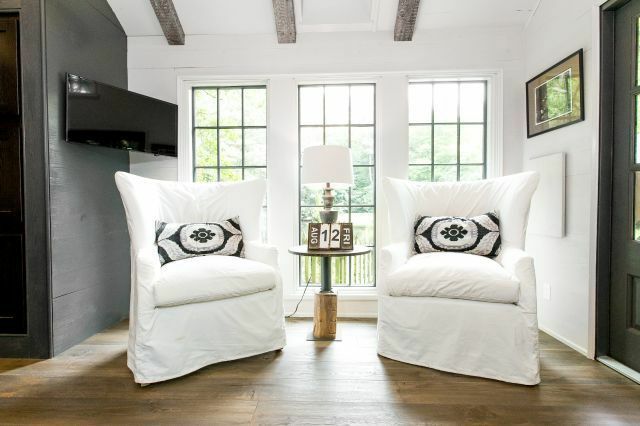 Just look at these tall windows that bring the outdoors in, and the beautiful oak hardwood floors. The kitchen has a bar that seats 4 people. 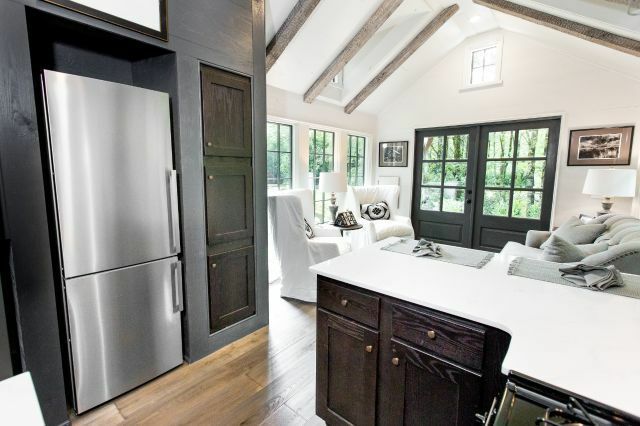 There is a large pantry to the right of the full-size refrigerator. 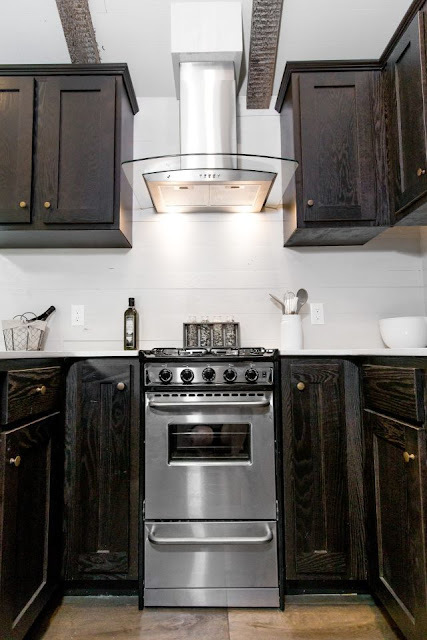 Other deluxe appliances include a gas stove, dishwasher, and washer/dryer. 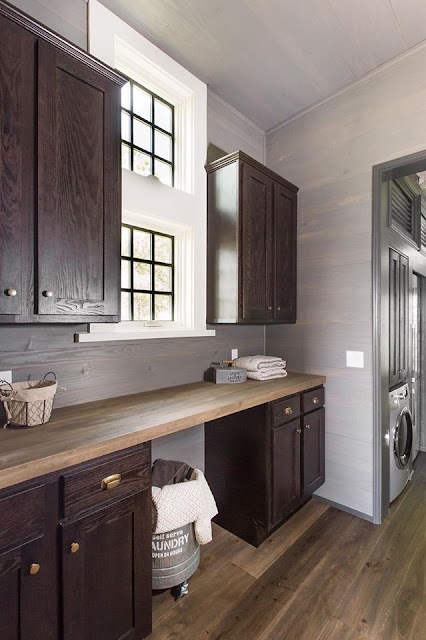 Next to the kitchen is a room with storage and counter space for folding laundry. But imagine what other uses this could have, such as a craft or sewing room, or an office. Across from the laundry room is the full bathroom. 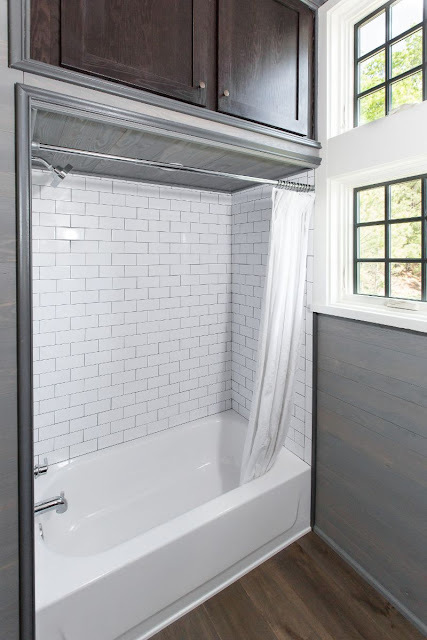 Storage above the tub/shower shows that no space is wasted. The master bedroom has dual closets and an alcove for a desk or other piece of furniture. Think, though, how sweet this would be with a window seat. The bedroom accommodates a queen-size bed with room for nighstands. You can't see it in these photos, but there's an exterior door in the bedroom that could lead onto a private deck or garden. I love this little house. 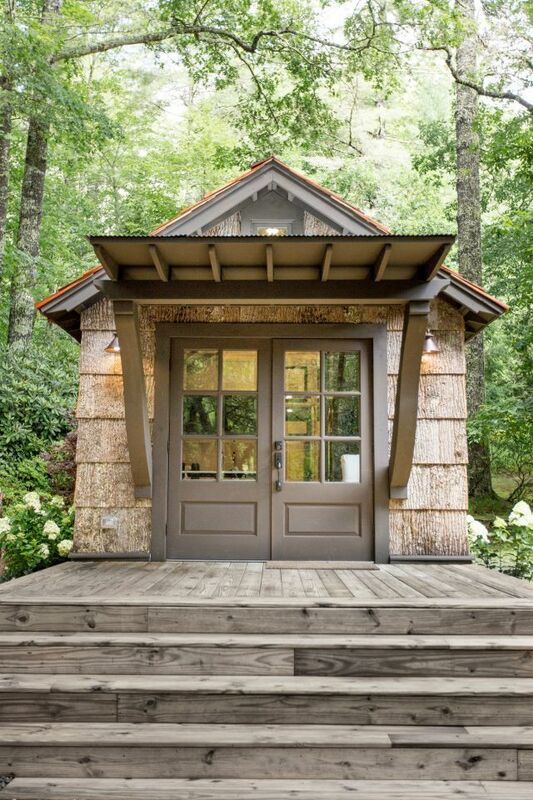 It's a tiny house that's not on wheels and accommodates free standing, full-size furniture. The Low Country is thoughtfully designed to live large. And it's approved by my personal resident architect. He likes it as much as I do. The Low Country is not yet available for purchase, but we understand it will be soon. For more information and to see a floor plan you can visit the Designer Series Clayton Tiny Homes website here. Click here for a 3D tour of the Low Country. Disclaimer: This is an independent post and the author is not associated with Clayton Homes or its representatives. 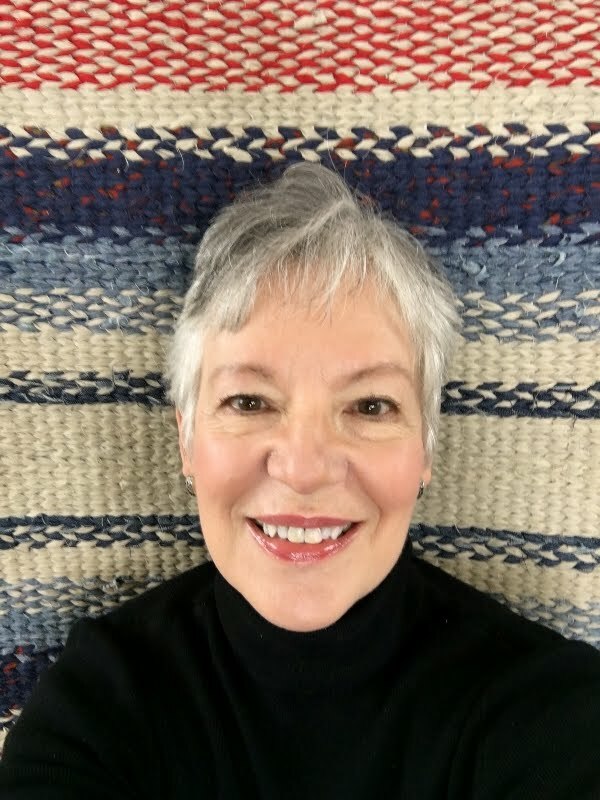 The opinions expressed are her own and she is not endorsing Clayton Homes or its tiny home series. Interested parties should conduct their own thorough research before making any purchase. Technically, we have one bedroom and a den (my studio). If we added a closet to the den it could qualify as a bedroom. We're actually talking about doing that for appraisal value. Oh, you're SO right about this house - its character, comfort and convenience! At first I thought it was going to have one of those loft bedrooms (which is not an option for us.....). "Wow" is all I can say. State of the Art . . . Missed how many sq ft . . . Loved the wide open door look right through . . . This design is definitely one to remember. This one I could live in! Nice layout! 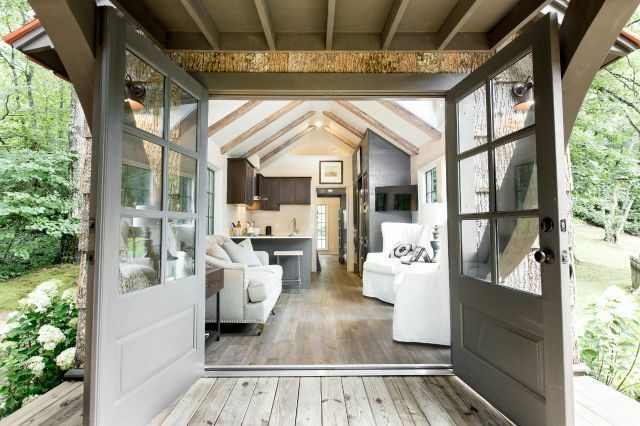 You know, it just occurred to me recently, as I was looking at different tiny house designs that I wondered why I wasn't seeing many mobile homes taking this path. This is just beautiful! My family and I are feeling more and more pulled towards this, as God continues to lead us to let go of more and more. We would absolutely need 2 bedrooms, but, other than that, this house would be perfect for us! Thank you ever so much for sharing and for your precious encouragement to me, too. Sending much love to you this beautiful Lord's Day! It's a really nice home, very chic. I like this home a lot, but I much prefer your little house with its cottage charm, Nancy! Oh, you're so sweet to say that, Laura! Thank you! I love how big it looks and all that is in it for being so small. I would love it as a weekend getaway. I think this is the one I've been looking for!! Heading over to their website now. P.S. I feel much as Laura Louise does. I too, prefer your sweet little cottage as it has a feel of warmth and cosiness that I don't feel with this tiny home. This is perfect. No loft bedroom is a definite plus. I like everything about except the bedroom décor is a little stark. If I could find affordable land in this are and they would permit that size I would be heading to that site to order. Have a blessed week my friend. What a fabulous tiny house....it could be decorated to get a more cozy feel, I think. Thank you so very much for coming over and leaving such a nice, heartfelt comment. Hi Nancy, I love the look of the exterior. I think the setting makes it special. I am trying to figure out where those triple vertical windows are. Do you think the bottom one has been closed over on the inside? Now that was cool. To be able to see the home through the tour helped to see how brilliant the design is, which captures large living in a small space. 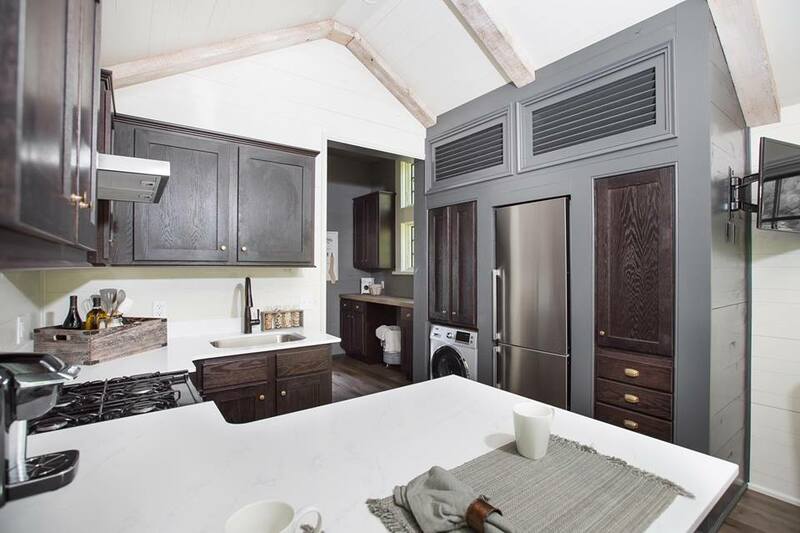 The high ceilings and beams and sleek appliances AND generous use of windows makes this cottage appear much larger. WONDERFUL SHARE! I can see why you like this little home. I can also see myself living there! It's darling and has so many great features. It's fun to dream about the possibilities! Love love love this one. Love the styling and the use of the space is amazing. Wow a full tub too. Just beautiful. Wow, that looks quite spacious and has everything you need.It has a nice calming effect. Wow! That's a lot of style packed into that small space and to look at it you would never guess that it was that small. It looks airy and spacious. 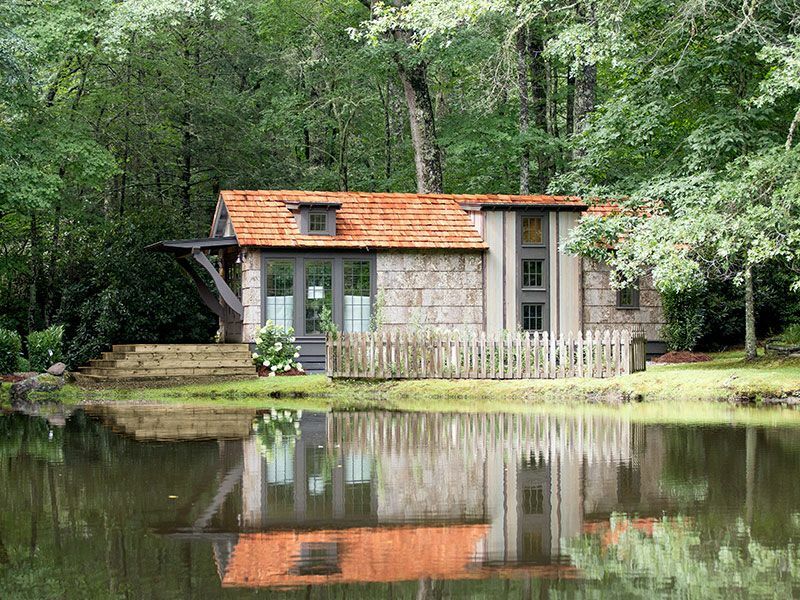 My favorite tiny house ever! This one is so well thought out. If they had a 2-bedroom version, I just might have to think long and hard... Thanks for sharing. Light, light, light come through those big (double doors) and small windows (above the desk), to make it feel BIG! Very charming! There's definitely a trend for living small. Such a stunning home! Clean lines yet lots of character. Excellent design and it doesn't feel small at all. This looks like an ideal small home; I could imagine living in it. Sometimes I think of putting one in my backyard and living in it, and letting my adult children live in the big house. I could move into this house in a heartbeat. I'd struggle with the small, single kitchen sink, but I'd get use to it. Love this!